1 - DMNA Annual Meeting, Wed., October 17, 6 p.m.
7 - Want to Be a Welcomer? 10 - Why is the DMNA Supporting a Pedestrian Island on Seminole for the Cannonball? 15 - Clean Sweep Closing for the Season on October 31st. 18 - Using an Absentee Ballot? Read these Cautions. Do you think self-government and working on neighborhood initiatives and problems is boring or thankless or ineffective? Think again. 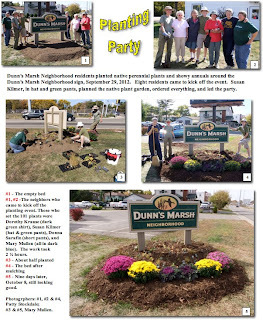 Time and again the Dunn’s Marsh Neighborhood Association has proved that coming to meetings and working to improve the neighborhood can be stimulating, rewarding, and effective. On that note, we invite everyone in the neighborhood to attend the Annual DMNA meeting this Wednesday, October 17, at Prairie UU Society, 2010 Whenona Drive (corner of Whenona and Crawford). Doors open at 6:00 pm and the business meeting starts at 6:30 sharp. If you are wondering what might be in store, below is a sneak preview. · Brief mention of a handout listing 2011-2012 DMNA accomplishments, plus recognition of people who contributed the most to making them happen. We’ve been very busy this year. · Bylaws revisions (See the article about bylaws in this newsletter as well as the attachment). 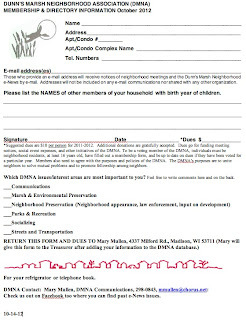 Please note that ALL neighborhood residents are invited to participate in the open discussion, but only signed-up members of the DMNA may vote on dues, bylaws revisions, and elections. See the separate article on membership. Snacks will be available to keep up your energy! 4. Fill out an application blank and pay any required dues. Dues are currently suggested at $10 per person. Get a jump on becoming a member by filling out the attached application blank. Then bring it to the meeting. Additional application blanks will be available at the meeting. 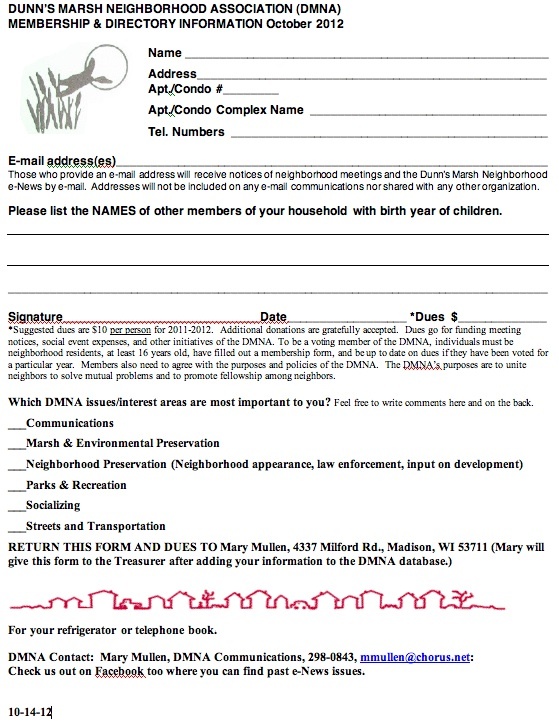 Dues go to DMNA expenses such as hardcopy newsletters, annual picnic expenses, annual report fees, and new initiatives of the DMNA such as the neighborhood sign which was this year’s major expense. Bylaws are living documents that need revising to reflect changes in conditions and how an organization operates. At its September meeting the Dunn’s Marsh Neighborhood Council recommended two major changes to its bylaws that hadn’t been revised since 2009. This change concerns committee leadership. The change is necessary due to previous changes in the bylaws. The bylaws now state that committee alternate chairpersons can vote on the Neighborhood Council in the absence of the primary committee chair. Well, committee chairs are no longer obligated to be on the Council at all as they were in the rather distant past. The recommended change would remove the statement about alternate chairpersons having voting rights on the Council. They simply don’t have those rights now, and the bylaws should be changed to reflect that. This truly major change would expand our service area to include the lands around Dunn’s Marsh in the DMNA service area. Now our southern boundary is the Cannonball Path (except for a little extension below Allied Drive). However, since its beginning in 1973, the Association has been very active in protecting the marsh. For example, the Association worked very hard from 1975 to 1979 to get Lots 19 & 20 in public ownership. We succeeded. The City of Madison, Town of Fitchburg, Dane County, and the State and Federal governments all chipped in to buy the land. Now the Apache Pond stands on those lots rather than another set of apartments or condos. The DMNA also was responsible for the provision in the Dawley Park deed that requires the DMNA to be informed if any of its provisions are change. Dawley Park straddles Seminole Highway south of the first curve in Seminole. From 1985 through 1988, the Association successfully lobbied Dane County to buy what was then the Schmidt apple orchard south of Dunn’s Marsh. That land is now proposed for a mountain bike park. Throughout the years, whenever there’s an opportunity to protect the marsh, the Association is standing in the wings ready to support those initiatives. Many additional examples could be cited. Because of continual interest in Dunn’s Marsh and because we take our name from the marsh, the Council recommends changing the bylaws to include all the public lands south of Dunn’s Marsh in our service area. Consult the map on the attachment to see the extent of this area. In reviewing the descriptions of the different sub-areas of the neighborhood, we also found we could “clean up” the wording. See the text of the bylaws to note these minor changes that are for clarification purposes only. 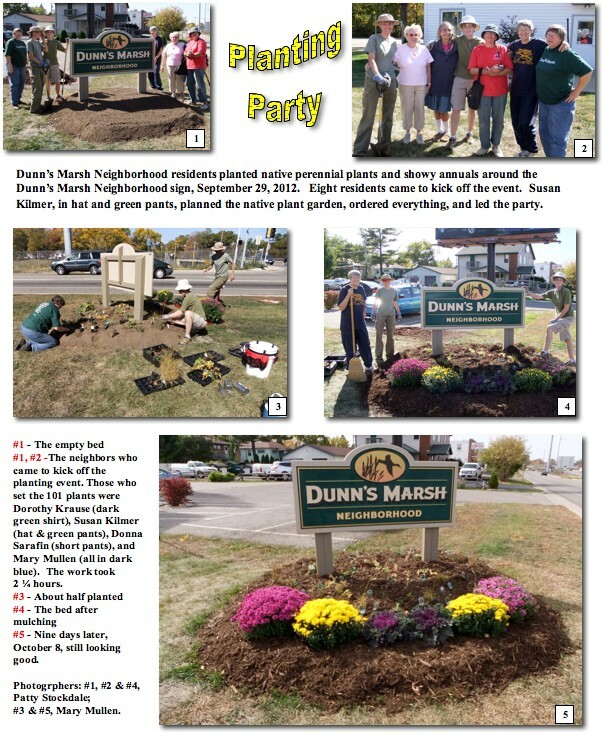 Eight people gathered at the Dunn’s Marsh Neighborhood sign on the Beltline Frontage Road September 29 to kick off the planting party. Four stayed to set, mulch and water the plants. In 2 ½ hours there were 95 native plants in the ground around the sign plus 4 big showy clumps of chrysanthemums and 2 ornamental kale plants in front of the sign. Present on a beautiful sunny Saturday at 1:30 pm were Susan Kilmer who designed the planting and led the party; planters Donna Sarafin, Dorothy Krause, and Mary Mullen; photographer Patty Stockdale; and well-wishers Sharon and Pam Flinn and Leatrice Hungerford. Right now it’s the yellow and magenta chrysanthemums that take your eye, but next spring, the native wildflowers will put in their appearance to show off and symbolize the more natural features in and around the neighborhood. The planting culminates an effort that began in 2008, was thought to have expired in 2010, and was revived in 2012 when DMNA Council Member Thea Bach learned from Madison Staff member Linda Horvath that we still had the approved grant we thought had expired. Kudos to all who helped at any stage. With an application for permission to place a Little Free Library in Marlborough Park underway and contact with a Prairie Unitarian Universalist men’s group made, the actual appearance of two Little Free Libraries in our neighborhood lurched a bit closer to implementation. They’ve been on the horizon since January. Others may follow since there is talk of one at the Boys and Girls Club (Jenewein Rd. 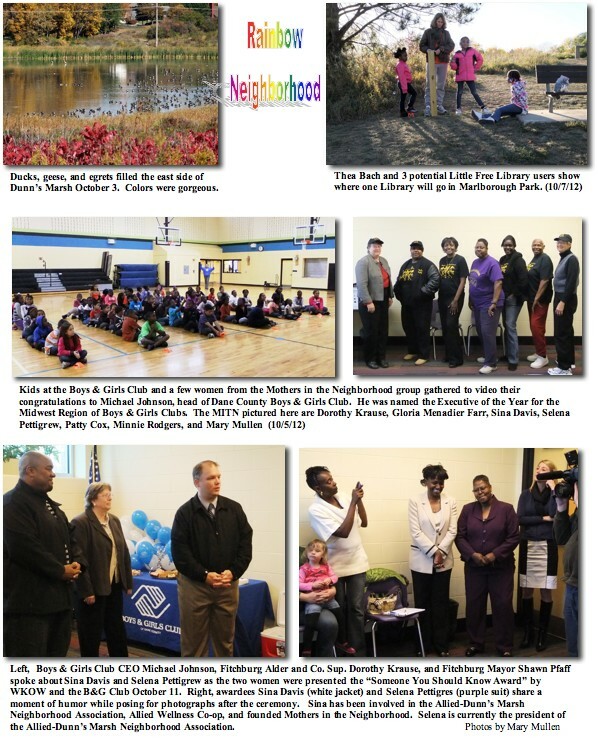 ), another at Joining Forces for Families (Allied Drive), and some chatter on the Dunn’s Marsh Neighborhood Association’s Facebook page about locating one or more in the Fitchburg part of the neighborhood, especially down along Crescent Road. On Sunday, October 7, DMNA Council member and Little Free Library advocate Thea Bach took another step toward two of the libraries. City of Madison permission is required for the LFL in the park. It will be placed next to the bench that overlooks the east soccer field. Late Sunday afternoon, an excited delegation of 2 adults and 3 kids trekked up to the park for the required photos of the location. Thea Bach came with a 4x4” post to symbolize the LFL. Mary Mullen came with her camera. The 3 little girls were just leaving the park with “gift bags” of what turned out to be sand and tire chunks from the playground - given to them by several unknown older boys. They were happy to turn around and join the fun and learn about the Little Free Libraries. By the time the photos were done, they were begging to join in painting one of the “birdhouse libraries.” See the photo that’s part of the attachment mentioned above. That same afternoon, Thea had arranged for Little Free Library inventor Rick Brooks to speak with the Prairie UU men’s group about getting Prairie’s already-painted Little Free Library in the ground at 2010 Whenona Drive. Rick was also slated to talk to the Andersons who live on the corner of Lumley and Danbury about another LFL that may go on their property. Things are movin’ right along. Look for those LFLs in the next weeks and months. The Dunn’s Marsh Neighborhood was a good place to be Saturday night if you were either a newcomer or an oldie in the neighborhood. About 25 of the invitees attended, a combination of neighbors who had moved here within the last year and DMNA Welcomer Committee members, Council members and their family members, and others who have lived in the Dunn’s Marsh neighborhood for some time - some time meaning anywhere from 5 to 50 years. Gracious hostess Diane Schultz provided the meeting space in her large and homey garage. We were surrounded by food and drink including four big pots of soup, heaping plates of appetizers, delicious salads, and platters of sweets. It turned out to be much more than we could eat. In the middle of the garage were coolers of various drinks. The main feature of the evening was self-introductions. We learned that a surprising number of our new neighbors work for Epic, the huge medical software company west of Verona or in a similar career, but at least one is a graduate student, one has her own independent home business, and another works for the Wisconsin Bike Federation. Among those of us who’ve been in the neighborhood for longer, the career or employer list was more varied including accountant, machinist, retired teacher, retired daycare provider, massage therapist, and those employed by the Arboretum, WPS, MG&E, Mendota Health Center, and Johannsen’s. As part of introductions, many of us mentioned how we happened to come to this neighborhood. Perhaps not surprisingly, the lower cost of housing was one common denominator. Some ew residents mentioned how they had wanted to get out of apartment living and had deliberately searched out a small house with a yard that wouldn’t occupy all their spare time. Several talked about how they had been attracted by a well-maintained or newly-remodeled house or simply its “cuteness.” Most also said they were finding the neighborhood very friendly and were happy they had moved here. The DMNA Welcomer Committee’s effort has to be a part of the friendliness they’ve felt. All the new residents who attended this party were from the Marlborough section of the neighborhood within 2 blocks of Seminole Highway, specifically Whenona, Sheffield, Danbury, and Windflower Way. We “oldies” hailed from the Marlborough, Crawford, and Belmar parts of the neighborhood. Many thanks to all who came and to Diane for providing a pleasant place to meet. The neighborhood is a warmer and friendlier place to be now that we’ve had a chance to become better acquainted. A Welcomer Committee member attends the monthly Committee meeting which just happens to include a delicious (free) meal prepared by Diane Schultz at her home. At the meeting we put together Welcomer binders of information about the neighborhood and occasionally plan an event like the party described in the previous article. It stands to reason that Welcomers keep an eye out for new move-ins in their part of the neighborhood. Welcomers then deliver the binders to newcomers and invite them to participate in the neighborhood association. The purpose of Welcomers is to make new residents feel comfortable in the neighborhood and to invite them to participate in the Dunn’s Marsh Neighborhood Association. Three people associated with the west side of neighborhood received prestigious awards recently. Michael Johnson, head of the Dane County Boys and Girls, was named Executive of the Year for the Midwest Region of Boys & Girls Clubs. Prior to the presentation, 50 kids at the Boys and Girls Club were taped chanting their congratulations. A handful of women from the group Mothers in the Neighborhood also gave testimony for the congratulations video. On October 11, Selena Pettigrew and Sina Davis were honored with the “Someone You Should Know” award from WKOW and the Boys and Girls Club. The two women have been very active in working for people in the Allied part of the neighborhood, and Sina has attended DMNA meetings and events. WKOW taped the ceremony which included remarks from Michael Johnson, CEO of the Dane County Boys and Girls Club, Fitchburg Mayor Shawn Pfaff, and Fitchburg Alder and Co. Supervisor Dorothy Krause. For pictorial coverage of these events, click on the attachment. Thanks to the efforts of Fitchburg Mayor Shawn Pfaff and Alder Steve Arnold, the Cannonball Path plan may include a pedestrian island where the ped/bike path crosses Seminole Highway. While the Public Works Committee turned down the revised plan that would put in the island, the Public Safety and Health Committee postponed their decision until Alder Carol Poole’s questions could be answered by the Fitchburg Transportation staff. The Transportation and Transit Commission unanimously supports the revised plan. Families, dog walkers, bicyclists, and any others who use the path that runs along the south edge of the neighborhood are urged express their opinions at the meetings or to Fitchburg alders Dorothy Krause and Carol Poole who represent the DMNA area in Fitchburg. These were the points made by the DMNA at recent meetings in which Fitchburg was considering the pedestrian island for the Cannonball Path crossing of Seminole Highway. The Dunn’s Marsh Neighborhood Association voted at its September 5, 2012 meeting to ask Fitchburg to reconsider its rejection of the pedestrian island on Seminole at the Cannonball Path crossing. In addition to the island there, the motion also requested that pedestrian-operated flashing yellow RRFB lights be provided at both the Cannonball and Capitol City Path crossings. These lights have already been approved by the Fitchburg Common Council. The DMNA asks that the Fitchburg committees recommend the lights and the pedestrian island. 1. Increasing traffic on Seminole Highway. Traffic on Seminole is now heavy and the road will be much busier when the Verona Road project starts in 2014. Construction will continue for THREE years. Traffic is estimated to increase by 350-450 cars during the peak hours. It’s often difficult to get across Seminole now. It will be even harder with additional traffic. 2. This will probably be a more-used crossing than the Capitol City Path. The Cannonball is flat as opposed to the hilly Capitol City Path. It will likely become a commuter path since it will cross the Beltline and bring bicyclists eventually to Fish Hatchery Road. Providing raised medians or pedestrian refuge areas at pedestrian crossings at marked crosswalks has demonstrated a 46 percent reduction in pedestrian crashes. At unmarked crosswalk locations, pedestrian crashes have been reduced by 39 percent. Installing raised pedestrian refuge islands on the approaches to unsignalized intersections has had the most impact reducing pedestrian crashes. In the first week after the raised pedestrian refuge area and RRFB were installed, over 900 crossings were reported with over 85 percent of motorists yielding to pedestrians. 4. Very reasonable cost for the benefit derived from it. Fitchburg pays only 20% of the total cost if the island is installed as part of the Cannonball project. Cost of the island to Fitchburg is set at $14,760 (1.52%) of a total capital budget of $973,651 (2012 CIP budget - The 2013 budget isn’t finalized, but presumably it would be around this amount). Without going into all the calculations - although they can be provided on request - the island safety feature would cost the average Fitchburg homeowner $1.62 in property taxes. If the island saves just one life, isn’t it worth $1.62 for each homeowner? Open house meetings will occur at two different locations during the next six months to promote public understanding of the Verona Road (US 18/151) Project. Wednesday, October 17 – 10 a.m. to 1 p.m.
Wednesday, November 21 – 10 a.m. to 1 p.m.
Wednesday, December 12 – 5 to 8 p.m.
Wednesday, November 7 – 5 to 8 p.m.
Wednesday, December 5 – 5 to 8 p.m.
WisDOT representatives will be available at both sites to discuss the project on an individual basis and to respond to questions and feedback. Project maps, displays, documents and handouts will be available, including a copy of the Final Environmental Impact Statement (FEIS). Construction to outlying intersections scheduled for 2013. Corridor construction scheduled for 2014. Visit the project website <http://www.veronaroadproject.wi.gov> for more information about the Verona Road (US 18/151) Project. If you are unable to attend the open house meetings, or would like more information, contact Mark Vesperman at (608) 246-7548. Written comments regarding the project can be mailed to Project Manager Mark Vesperman, WisDOT, 2101 Wright Street, Madison, WI, 53704. Citizens who are deaf or hard of hearing and require an interpreter may request one by contacting Mark Vesperman at least three working days prior to the meeting. When I was living in St. Paul 20 years ago, I read an article about a neighborhood where crime was increasing and residents were moving out. The article quoted a woman who had decided to stay and continue raising her children there. She said, in effect, “If all the good people move out, of course the neighborhood will go downhill! If I left, I’d be part of the problem. I’ve decided to stay and be part of the solution instead.” That woman’s words have remained with me all this time, not only because of the simple truth she expressed, but because she was standing behind that truth with her own actions. The recent reaction to the closing of Meadowood Ace Hardware has brought this quote back to me. So I want to challenge my neighbors in Meadowood and the rest of southwest Madison, to stay and be part of the solution. · Send your children to our neighborhood schools and get involved in those schools. If you have concerns, bring them to the principal and teachers and try to make the school better for everyone. If you like the school, let parents of younger children know. · Take your preschool children to the park, and introduce yourself to other parents you meet there. Or bring them to Play & Learn at the Meadowood Neighborhood Center on Friday mornings. · Pick up trash in your neighborhood streets and parks. · Support our local businesses. Get your hair cut at the Meadowood barbershop, get your clothes cleaned at Best Cleaners, pick up some takeout at Chang Jiang or Thai Basil, fill your prescriptions at Walgreens, etc. · Get to know community members who aren’t your immediate neighbors. Attend a Meadowood Community Supper (the next one is in January). Get a community garden plot meadowoodcompost@yahoo.com <http://webmailb.juno.com/webmail/new/5?userinfo=f77e90e111078fb13f073e61f133462d&amp;count=1349027473&amp;type=no%2Dmagic&amp;userinfo=f77e90e111078fb13f073e61f133462d&amp;count=1340074739&amp;cf=SP2&amp;randid=1373236890> . · Join one of our neighborhood workgroups. Southwest side residents are currently tackling issues including housing john@cwd.org <mailto:john@cwd.org> , economic development jerace91804@me.com <http://webmailb.juno.com/webmail/new/21?folder=Inbox&amp;msgNum=00007HW0:001GPGsn00002t29&amp;count=1348795139&amp;randid=452072963&amp;attachId=0&amp;isUnDisplayableMail=yes&amp;blockImages=0&amp;randid=452072963> , hosting the southwest farmers market , http://www.facebook.com/pages/Madison-WI-Southwest-Community-Farmers-Market/86387742218?fref=ts <http://www.facebook.com/pages/Madison-WI-Southwest-Community-Farmers-Market/86387742218?fref=ts> and planning our community suppers ksnhh@juno.com <mailto:ksnhh@juno.com> . The more people than join in, the more effective we can be in these efforts. · Be a mentor—sign up to mentor a child through Big Brothers and Sisters http://www.bbbs.org <http://www.bbbs.org/> , Mentoring Positiveshttp://www.mentoringpositives.org/ <http://www.mentoringpositives.org/> , or Madison Urban Ministryhttp://www.emum.org/ <http://www.emum.org/> . Tell them you’re from southwest Madison and are interested in mentoring a child from this area. · Get involved in local government by contacting your alder http://www.cityofmadison.com/council/councilmembers/findAlderByAddress.cfm <http://www.cityofmadison.com/council/councilmembers/findAlderByAddress.cfm> and offering your thoughts and suggestions for how to improve your neighborhood. Police and city staff must be part of the solution, but we can't sit back and expect them to do it for us. A little effort, by many people, can make a big difference! Where can you get a free education about nature at a world class institution close by our neighborhood? Of course, at the University of Wisconsin Arboretum. The Arboretum offers dozens of opportunities. Below are some coming up this month. Ecological Restoration Work Party: Grady Tract [The Grady Tract is the area just west of Seminole Highway on the border of the Dunn’s Marsh Neighborhood.] Saturday, October 20 • 9 am – 12 pm. Volunteer for restoration activities and learn about prairies and savannas. Meet at the Grady Tract parking lot at the corner of Seminole Highway and the Beltline Frontage Road. Special Event: Trolley Tours, Sunday, October 21 • 1:00, 2:00, & 3:00 pm. Free tickets at the Visitor Center. Access the Visitor Center via Arboretum Drive from Seminole Highway a few short blocks north of the Beltline. Walk: Woodlands, Sunday, October 21 • 1 pm – 2:30 pm Enjoy what is usually the end of peak for fall color in the restored woodlands of the Arboretum. Ecological Restoration Work Party: Core Area and Curtis Prairie Saturday, October 27 • 9 am – 12 pm Volunteer for restoration activities and learn about prairies and savannas. Meet at the front steps of the Visitor Center. Earth Partnership for Families: Whispering Trees, Sunday, October 28 • 12:30 pm – 4 pm Trees are full of colors, patterns, shapes and numerous other hidden treasures. There will be activities all about trees in the Visitor Center from 12:30-3:30 p.m. An exploration hike to Longenecker Gardens is from 1:30-2:30 p.m. Walk: Tour of the Lost City, Sunday, October 28 • 1 pm – 3:30 pm While we always tour this area around Halloween, there is really nothing spooky about this abandoned dream of a Venice of the North. Learn more about this failed 1920s residential area and how understanding the land can be important for proper development. This tour starts indoors with a brief overview of the Lost City project. The Dane County / City of Madison Clean Sweep Program for recycling household hazardous waste will end its 2012 season on Wednesday, October 31st at 2 PM. Items that can be dropped off at Clean Sweep include oil based paints, pesticides, poisons, household products containing organic solvents, ignitable, aerosols, and non-automotive type rechargeable batteries. On the final day, all traffic will be routed to the Badger Road driveway behind the Dane County Highway garage. Customers will be directed to drive through the facility and remain in their cars while the products are unloaded. The Product Exchange will be closed during this period. Customers with large loads will be directed to a parking stall for unloading. A large turnout is anticipated, so there may be delays. The Clean Sweep staff highly recommends that you should avoid the last day rush and drop off materials before the 31st. Normal hours of operation are on Tuesday – Saturday from 7:00am to 2:00pm. The site is located at the Dane County Highway garage, 2302 Fish Hatchery Road in Madison. There is only a short time to make an appointment to dispose of very small quantity generator business wastes. Appointment times are filling up fast, so make your appointment soon. October 19th is the last day for business appointments during our 2012 season. Prior to the last Saturday the site can be accessed from West Badger Road. It is important to drop off household hazardous waste during the listed hours of operation. Leaving materials at the site when it is closed is illegal and can lead to a $2,000.00 fine. In early 2013, Clean Sweep will be moving to a new permanent facility which will allow the program to operate all year long. More details about this will be announced later this year. To find out more about any of the Clean Sweep programs, please visit our Web site at www.danecountycleansweep.com. 2. Love Your Lakes, Don't Leaf Them Campaign, September to November - Fitchburg City Hall (5520 Lacy Rd) - Stop by Fitchburg City Hall to view a special display cabinet (created by Mac Olsen and Dan Fourness) describing tips on keeping leaves and grass clippings out of the street (and storm system) and using them as nutrients in your yard and garden areas. FREE Yard signs, beverage coasters, and DVDs with information on the Love Your Lakes, Don't Leaf Them are available in the Main Lobby. 3. Compost Bin, Rain Barrel, and Yardwaste Polybags Sale - Sat., Oct. 20th (from 9-11am) - Fitchburg's Recycling Drop Off Site, 2373 S. Fish Hatchery Rd. - Earth Machine home compost bins ($45 - normally $100), Systern rain barrels ($55 - normally $110), Norseman compost turners ($15), Norseman Kitchen scrap pails ($7), and Dayton 50-gallon Yardwaste Polybags ($2 - normally $6) will be available for sale. The supplies will be sold on a first come, first served basis. Advance registration is recommended by contacting rick.eilertson@city.fitchburg.wi.us. Up to 2 FREE Yardwaste Polybags will be available for residents participating in Fitchburg's curbside refuse and recycling program. Visit www.city.fitchburg.wi.us for more information as the event approaches. 4. Fitchburg's Fall 2012 Electronics Recycling (Surplus-IT's warehouse - 901 Watson Ave. - 7:30am-11:30am) & Shred Day Event (Oak Bank's Parking Lot - 5951 McKee Road - 7:30am-10:30am) - Sat., Oct. 20th - visit www.city.fitchburg.wi.us <http://www.city.fitchburg.wi.us <http://www.city.fitchburg.wi.us> > for more information as this event approaches. 5. Eco Book Group - Tues., Oct. 23rd (from 6 - 7 pm) - Fitchburg Library (5530 Lacy Rd) - Are you interested in reading about and discussing environmental issues like conserving energy, saving water, eating well and driving less? If so, join the new Eco Book Group! At the first meeting we will discuss "In Defense of Food" by Michael Pollan, in which he writes about the bad nutritional advice and foods being consumed today. Check www.enactwi.org or contact Jamie Hernandez at jamie.hernandez@city.fitchburg.wi.us or 729-1784 for more information as this event approaches. · UW’s Steve Carpenter, one of the world's most influential environmental scientists, comments on the future of the Yahara watershed. Starting at 7:30 a.m. with the Yahara Lakes Community Breakfast hosted by the Clean Lakes Alliance, the information-packed day also includes the full day of presentations, lunch, and a closing reception. The special one-day rate of $45 is supported by sponsors to enable maximum participation by local residents. You won’t want to miss the full day of presentations and discussion, so register now at www.nalms.org <http://www.nalms.org <http://www.nalms.org> > ! After October 26, the Friday rate increases to $65. As we approach the November 6 election, campaigns are pushing people to “vote early. Broadcast ads, robocalls and mass mailings are bombarding us with information, some of which is confusing or even misleading. The following tips may save you time and help ensure your vote will be counted. Don’t be confused by mailings. Many voters in our battleground state are receiving mailings from political campaigns and independent groups, some of which contain a form to request a voter registration application or receive an absentee ballot. These mailings may include your telephone number, birth date and voting record. The organizations behind these mailings gather information from multiple sources. For example, your voting record is public information, and the state does sell voter lists to private organizations. However, your birth date is not public, and there is no record of how you voted in any given election. It is best to work directly with your municipal clerk’s office or a Special Registration Deputy with a trusted organization, rather than respond to a mailing by an organization which might not understand Wisconsin election law. 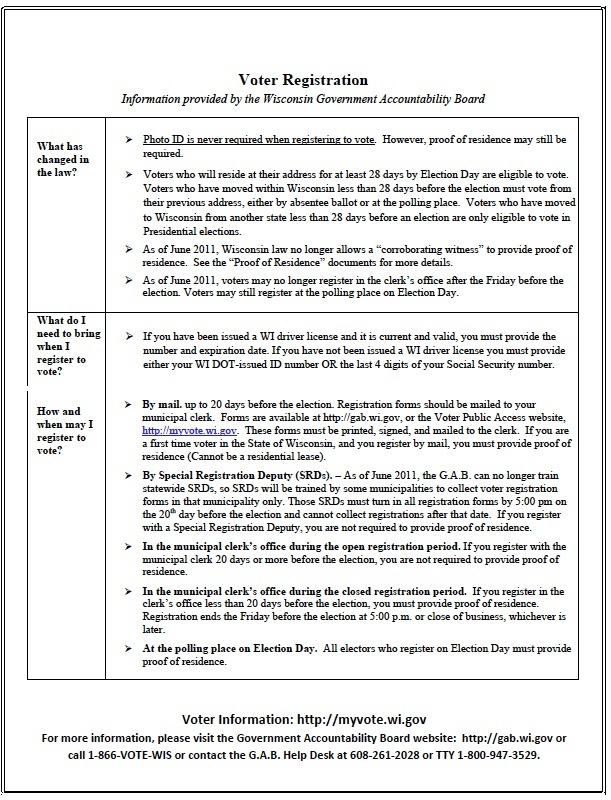 Start online at the Government Accountability Board’s voter information website https://myvote.wi.gov/ Fill out the form and print, sign and return it to your Clerk. Your information will be saved in the system waiting for the Clerk to receive your signed paper form. Forms postmarked by the close of open registration on October 17 do not require additional proof of residence. Forms received afterward will require additional proof of residence to be provided by you at the polling place. Register in person at your municipal Clerk’s Office by Friday, November 2. Madison residents go to Clerk’s Office in the City-County Building on Martin Luther King Blvd. Fitchburg residents go to the Fitchburg City Hall on Lacy Road just east of Fish Hatchery Road. Take your driver’s licence and proof of residence. Register at your polling place on Election Day, Tuesday, November 6. Proof of residence will be required. If you have a driver’s license, its number must be put on the registration form. Follow the instructions for absentee voting. If you complete your absentee ballot or certificate incorrectly, your vote will not be counted and you probably will never even know it. To avoid this, carefully follow the instructions you receive with your absentee ballot. If you can, it’s better to vote absentee in person at the clerk’s office so that the envelope is filled out correctly. Mail your absentee ballot back to the Clerk’s Office as early as possible. It must be postmarked by Election Day and received by November 9. Alternately, you may cast an absentee ballot at your Clerk’s Office between October 22 and November 2. A final word of caution. A law passed last year makes it a felony to vote at the polling place if you have already returned a completed absentee ballot. Previously voters who cast an absentee ballot before the election, and then changed their mind or realized they made a mistake, could go to the polling place and vote on Election Day if their absentee ballot had not already been counted. Their absentee ballot would not be counted. This is no longer an option. The League of Women Voters of Wisconsin Education Network is a nonpartisan organization that advocates for informed and active participation in government. If you intend to vote absentee, it’s better to vote in your city clerk’s office than to get an absentee ballot and send it in by mail. If you do or absentee voting in the clerk’s office, the staff will check whether the front of the envelope is properly filled out. If you mess up the “certificate” on the envelope, election officials will have to reject your ballot on election day and you may never know it. Weekdays: Mon, Oct 22 - Fri, Nov 2: 8 a.m. to 7 p.m. Weekend: Sat, Oct 27: 8 a.m. to 4 p.m.
Sun, Oct 28: Noon to 6 p.m.
October 22nd - 26th, 7:30 a.m. - 4:30 p.m. Sat., Oct. 27 - 8:00 a.m. - 1:00 p.m.
October 29th - November 1st, 7:30 a.m. - 6:00 p.m.
Fri., Nov. 2nd, 7:30 a.m. - 7:00 p.m.
To vote in the November 6 presidential election, you must be registered. It’s pretty easy because now you can do this by mail. Registration just got easier. 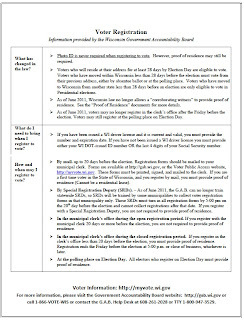 You can fill out a registration form on-line at http://gab.wi.gov/forms/gab-131-fillable and also attached here, then print it out and mail it by October 17. The catch is that you must provide proof of residence if you are a first-time voter in Wisconsin and you are registering by mail. Junk mail or mail from a relative or friend DOES NOT constitute proof of residence. It goes without saying that the proof of residence must contain the voter’s current and complete first and last name, the residential address, and is valid on the day used to register to vote. The form also asks for a signature. Find the “SIGN” options on the menu bar at the top of the pdf form. You’ll get a choice of using a typed signature, of drawing your signature using the mouse, or of importing an image of your signature. If you do register by mail, it would still be a good idea to take proof of residence with you to the polls just in case the “proof” you mailed in wasn’t an approved type or was invalid for some other reason. Voters may still register at the polling place on the day of the election. 1. Seek out debates sponsored by trustworthy nonpartisan organizations. The moderator and format should give all candidates an equal opportunity to speak and respond to questions. If the debate is televised, be aware of moderator comments, reaction shots, or other techniques that might bias viewers. 2. Consider gathering with friends or family to watch and discuss the debate. Have a potluck with your family, book club or other group. 3. Pay attention to how the candidates respond to questions. Do they answer them directly or evade them? Do they give specifics or speak in generalities? Do they speak about their own positions or mostly attack their opponents? Do their answers seem overly rehearsed or “canned”? Are their positions consistent from one question to the next? Maybe you are curious about what the November 6 ballot will actually look like. It has many more choices on it than you may be aware of, but it’s easy to get a preview. If you live in Fitchburg, click on the Assembly District 47 link. If you live in Madison, click on Assembly District 77. You will see a scanned sample ballot. On that site you can find out if you are registered, find the address of your polling place, see a list of all the candidates in the up-coming election (though not a scanned ballot), find out who all your elected representatives are from the federal to the local level (although the state Assembly District representative is incorrect), look at your past voting history (Mine goes back only to 1986 although I started voting in 1964), get other information about voting in a Q & A format, and find other information as well. Try it out. It’s fascinating.